FANS of local hard rockers Empire Assassins have been waiting for this for some time now, so I Heart Edmonton is excited to welcome the group back to the stage this Friday night. Guests Jezibelle will also brave the crowd during the Wooly Bully's show on Whyte Ave., marking Empire's first Edmonton gig since commencing their hiatus from touring and recording last year. Last month they performed their first show of 2010, in Saskatoon, before hitting up Legal, Alberta a couple of weeks later. Kevin Schmidt (vocals, guitar) and Stu Murland (drums) will reunite with Empire's former bassist Trevor DePagie for the gig, though the band is currently in search of a more permanent bass player for future shows. In fact, if you're interested click here. 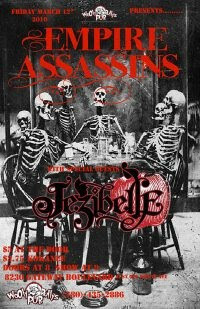 Jezibelle, which also calls Edmonton home, is an all-female indie rock group who've pulled their set together through the influences of Motley Crue, AC/DC, L7, and The Distillers, to name a few. To see what the end result of these mutual musical guides, check out Jezibelle's MySpace page. Or you can head down to Wooly Bully's this Friday for the live version. Tickets are only $5 and are available at the doors, which open at 8:00PM. By the way, Kokanee's are just $3.75 all night long!